The Montreal Angels travelled to Ottawa this past Saturday for the first of what will be a three game series of 18-a-side football in 2015. Clad in orange courtesy of the NDG Giants the Angels and Swans put on a fast paced display of women's football, Ottawa holding a slender lead through the first 3 quarters. The Swans experience in 18-a-side football prevailed in the final quarter as they ran out 31 point victors, Angels 1.6 (12) defeated by Swans 6.7 (43). Despite the loss the Angels unearthed some exciting new talent in Francesca and Gab Benedetti and Kirsten. 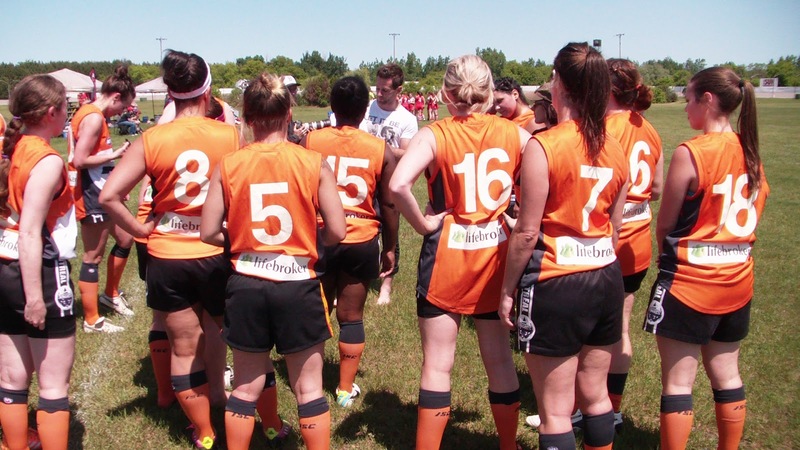 Round 2 of AFL Quebec's 9-a-side competition resumes this Sunday at Parc Vanier. The Ottawa Lady Swans have made a preliminary announcement that they will move from the Ontario AFL and join AFL Quebec in 2015. The move comes after an incredible 2014 season for the Lady Swans in which they claimed their first OAFL premiership. Ottawa will enter two teams into the competition, thereby expanding the fledgling AFL Quebec Women's competition to four teams and creating a perfect launching platform to build on the success of women's footy in the region. Travel theme. Theme images by fpm. Powered by Blogger.